The organisers of the Ealing Half Marathon have confirmed Ealing Fields High School as the winner of the 2018 Schools Challenge. Ealing Fields raised more than any other school based on the average per runner at the 2018 Ealing Half Marathon, which took place on Sunday 30th September. Their team comprised of member of staff Mr Woodham plus parents to pupils at the school Aled Davies, Juliet Doe, Susan Simpson and Mohit Jain. The school was presented with a cheque for £250 this week to recognise their efforts and achievement. Projects set to benefit from the boost of income include a new minibus, just as last year one school put the money towards new computers. These are great examples of how funds raised at the Ealing Half Marathon can be invested to meet specific school needs. 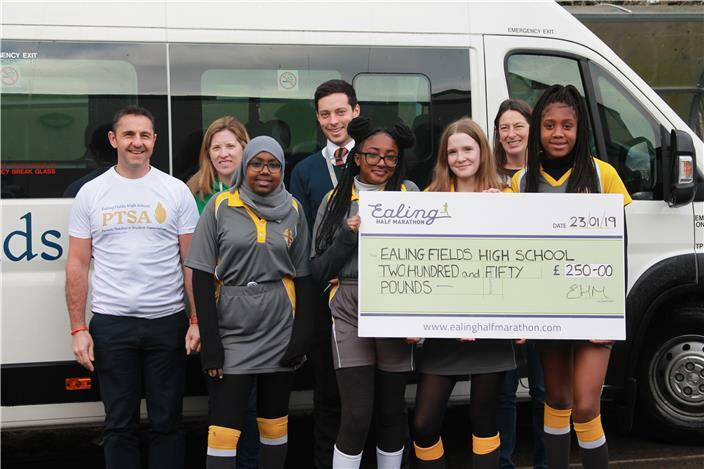 It is hoped that the excellent use of funds at Ealing Fields High School will inspire many schools to take part in the 2019 Ealing Half Marathon. TheSchools Challenge returns for the 2019 event which takes place on Sunday 29th September and entries are open now. With their extensive experience in running, the Ealing Half Marathon team are able to help schools get started with practical training sessions and advice, as well as local running club, route and nutrition information. With eight months until race day, there is plenty of time for parents, governors and teachers of all abilities to get race fit and look forward to a superb race next autumn. The Ealing Mini Mile and the Family Mile will take place on Saturday 28thSeptember, giving young runners aged 1-16 years the chance to enjoy the thrill of a large sporting event. Just a handful of places remain for our younger runners. For help and advice training for this event go to the Training and Advice section of our website.